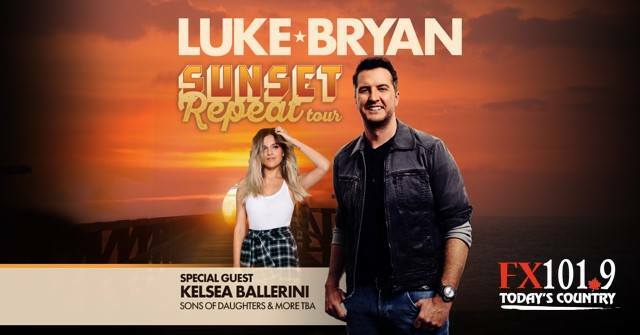 Luke Bryan – Sunset Repeat Tour live at Magnetic Hill in Moncton, New Brunswick on August 10th, 2019! With special guest Kelsea Ballerini and Sons of Daughters with more artists yet to be announced! Luke Bryan is back by popular demand in the Maritimes following a 2018 sold out show at the Cavendish Beach Music Festival. Luke is a two-time Academy of Country Music and a two-time Country Music Association Entertainer of the Year, a five-time host of the ACM Awards, a NSAI Artist/Songwriter of the Year and was named a CMT Artist of the Year six consecutive years. Luke has more certified digital singles than any other country artist with 46 million tracks and 12 million albums with four Billion music streams. Luke has placed 22 singles at #1, 12 of which he co-wrote. In each of the last several years, Luke’s headline tours have performed for 1.5 million fans or more and in 2018 he headlined the most stadium shows in one year of his career, now totaling 34 stadium concerts to date. His 2019 “Sunset Repeat Tour” launches May 31 and will take the LOTTO MAX Stage at the iconic Magnetic Hill concert venue on Saturday, August 10th. Joining Luke on this tour stop, and marking her first show in the Maritimes is Kelsea Ballerini. Praised by The New York Times as being an “elegant songwriter,” GRAMMY nominee Kelsea Ballerini’s latest single, “Miss Me More,” hails from her acclaimed sophomore Album UNAPOLOGETICALLY. Ballerini remains the only female artist in the genre’s history, including female duos and groups, to claim #1 with her first three consecutive singles. Sons of Daughters, a modern, gritty, country duo from Vancouver, British Colombia are rising stars in Canadian country music and will be kicking off the show on the LOTTO MAX Stage at Magnetic Hill.